One night in Bangkok Chess Club… The Bangkok Chess Club usual Friday evening meetings are being held at Herrity’s Irish Pub in Sukhumvit Soi 33/1, on the second floor. It is a short stroll from the Phrom Phong BTS station / Emporium. Woodstock has made the not unreasonable request that everyone who comes to play chess buy at least one item from the menu – even if it is just a coffee. They charge us nothing, yet is costing them money to air-condition a room specially for us and provide a staff member. If you order anything from the menu, even a bottle of water, there will be no additional charge. But if you order nothing, there will be a bill for 50 Baht from Woodstock. This starts in December 2009. This is not an open tournament – Thai nationals and foreign chess players who are resident in Thailand are invited. One of the greatest rivalries in the history of chess has resumed as Garry Kasparov takes on Anatoly Karpov in the Spanish city of Valencia. 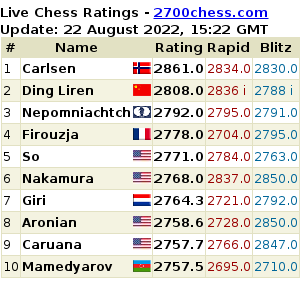 The 12-game rematch is taking place 25 years after the two chess legends first competed for the world title. The event is being broadcast live on Valencia’s regional government website (www.gva.es), with organisers expecting millions of chess fans to tune in. Kasparov, now aged 46, has been preparing for the clash by training in Norway with teenage prodigy Magnus Carlsen. Kasparov has described the match as “a ceremonial tournament”. 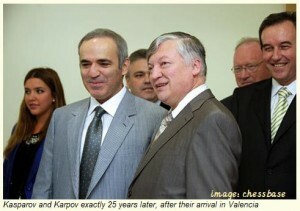 Meanwhile, Karpov, 58, has been sparring with a computer and a group of grandmasters from a base on the Spanish coast. The Valencia tournament comes 25 years after the two grandmasters – then both representing the Soviet Union – squared off for the first time for the world crown. BCC woodpushers dominated the Tamasart Chess Cup 2009 held at Tamasart University Campus Rangsit. Top seeded Henry “The Destroyer” Calacday flashed his old deadly form, led a 1-2-3 finish via tie break of 5.5 points against fellow BCC members Paul “The Bullet” Elauria and Manolo “ The Silent Assassin” Salamida. The 38 year old Henry Elo 2046 led the rest of the field on the first day with a perfect score of four after four rounds stumbled to Urs Hasler of Switzerland on the first game of the second day but was able to bounce back quickly after a convincing win against his compatriot Manolo then drew his last round with Paul, enough to claim the championship trophy with the highest tie break. Also an impressive display of performance was Paul who had a shocking defeat against fellow Filipino Dean Binoya on the first round then won his next five assignments and drew the last to claim the second place. Manolo kept hanging around with his position since the first few rounds and gave his final blow by trouncing Sawapop on the last round and went home as the third best player of the tournament. Grandmaster Nguyen Ngoc Truong Son from Vietnam lived up to his top billing by winning the KL Open 2009 with an impressive 7.5 points from 9 games and RM 10,000. And Uzbekistan Grandmaster Saidali Iuldachev proved be a comeback kid with a strong finish to score 6.5 points for sole third place and RM 3,000. Sorry about the down time. Sakab seems to be an Iranian malcontent with nothing better to do than pointlessly hack non-commercial websites. Hopefully he won’t be back. He has, however, made me aware of the security issues with WordPress, so I suppose that is useful.